ROBERT J. DUNCAN, age 93, passed away peacefully on January 23rd, 2019. Beloved husband of late Patti, loving father of Scott, Jeff (Jean) and Sue Orr (Tom), grandfather of James, Matt and Halle. 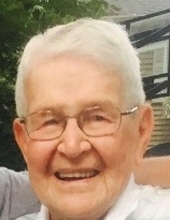 He was a WWII U.S. Navy Veteran who spent his career as a high school teacher and football coach at Columbus South High and Lakewood High School. Final resting place is Lakewood Park Cemetery. Family Services and Interment will be private. "Email Address" would like to share the life celebration of ROBERT J. DUNCAN. Click on the "link" to go to share a favorite memory or leave a condolence message for the family.